I really can't find the exact words to describe how I feel after watching 20th Century Fox's newest action flick offering this February — "A Good Day To Die Hard" starring Bruce Willis and Jai Courtney. I fell in love with this action movie, I might ask it to marry me if I have a chance because this movie is simply astounding! "A Good Day To Die Hard" takes us six years after the event that happened in "Live Free or Die Hard". 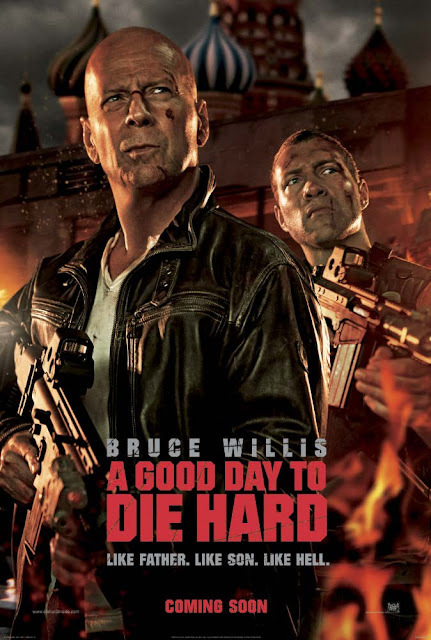 Though, not really related to the fourth installment, "A Good Day To Die Hard" is an independent movie (meaning, it can stand on its own) but brings the same adrenalin rush and testosterone-packed action scenes. This time, the fifth installment to the Die Hard series franchise takes us outside of the United States ground for the first time and fly all the way to Russia, where traffic is so difficult and the political turmoil is like everyday food for them. I never seen Russia destroyed before in a film like this one. Even the alien-thrill movie "The Darkest Hour" which is also set in Russia, is nothing compared to the destruction made by this "A Good Day To Die Hard" movie. The explosive scenes are truly breathtaking, they literally took my breath away and I literally gasped for air! It's like every ten minutes of the film, there are explosions going on! Especially that last action scene... truly remarkable... and yes.. breathtaking! When it comes to recent action films' ranking, I guess, "A Good Day To Die Hard" is my first when it comes to action scenes and explosions. The movies "Taken 2" and "The Bourne Legacy" would be my second and third in ranking, respectively. Bruce Willis is so old in this film. So, I guess his son, Jake played by Jai Courtney is really the hero in this film. But of course, it is a father and son tandem, and they look good together! After all, John McClane is "just having a f*cking vacation!" Hahaha! So, I guess this is Jake's (Jai Courtney) time to shine! It was really fun watching this movie, I really enjoyed it! If you are into an action-packed movie this season of love, don't forget to watch "A Good Day To Die Hard" starring Bruce Willis and Jai Courtney brought to you by 20th Century Fox. You will never get disappointed! I promise you this! "A Good Day To Die Hard" is now showing in the Philippines in more than 200 theaters, nationwide!